I am often grateful for the friends I have in London who are willing to go try out food with me, regardless of where it is located or whether there is any choice on the menu. I can basically say to P, hey, I heard of a place doing [fill-in-the-blank], and he'll say, when can we go? 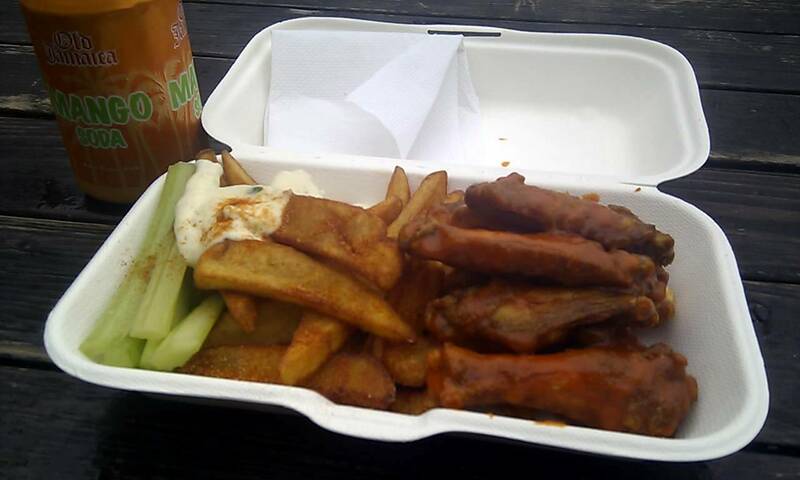 And this is how we found ourselves at a buffalo wing truck in East London for lunch. Those who know me (or have read previous entries like this, this and this) know that one of the things I crave is buffalo wings. While living in New York, I would have buffalo wings at least every couple of weeks, if not more frequently. The sudden absence of them when I moved to London was noticeable and I did make efforts to track them down, but they were pretty much always filthy (and not in a good way). All of this to say, I freaking love buffalo wings, and thank god The Orange Buffalo loves them as well. Not only do they do an original sauce, we also tried the Woof Woof which included scotch bonnet peppers and an array of spices that made for a slightly more complex and definitely more spicy experience. The wings were meaty and chickeny, and freshly fried before being tossed in the selected sauce. Fries and onion rings were also crisp and greaseless, and the blue cheese sauce, celery sticks and drink completed an admirable lunch deal for £6.50. If I could get them to park outside my house I would. It's a shabby pub but I love their wings.